This past Sunday I ventured to the Taste of DC, an annual 2-day food festival which takes over a good portion of Pennsylvania Avenue in the Northwest corridor of the District. Over 50 D.C. area restaurants and food trucks participated this year, with samples ranging from $2-$8. There were Asian, Italian, and American cuisines present, and even Ethiopian and Jamaican restaurants participating. The festival included a wine walk, music stage, beer garden, a culinary stage, and novelties like oversized beer pong, giant Jenga, a Stella Artois gif booth & a slew of food trucks. 1. I started off with Korean fried chicken from Oki Bowl. I’ve never been there but plan to go soon to try one of their rice bowls. 2. Next I tried the bulgogi from Kogiya Korean BBQ. I still am not sure what the white doughy things were, but the bulgogi was good. 3. Pinch Dumplings had some hearty dumplings. They offer lamb, chicken, pork, vegetarian, vegan and crab dumplings at their Pennsylvania Avenue location. I tasted the chicken and beef…two thumbs up. 4. I moved on from Asian to Cuban. Sophie’s Cuban Cuisine had a great curry chicken empanada that was branded with the restaurant’s name…cute and tasty. 5. My favorite by far was the ByU Crunch rito, a sushi burrito from Rolls By U. It was filled with shrimp tempura, crab, guacamole, tempura flakes, sriracha aioli, lettuce and cucumber. It was filling, tasty and refreshing all in one. Sadly, they’re only in Arlington, so I may just stick to some of the other sushi hand roll eateries in D.C. (hi Buredo, hi Maki Shop). 6. Honorable mention goes to the smoked chicken wing from Old Glory BBQ, and the lobster roll from Willie T’s Lobster Shack that was more roll than lobster. There was food… lots of food. This is a great event for D.C. newcomers who want to figure out what the city has to offer. If you’re a local, it’s a great opportunity to discover new restaurants that have popped up, as they do often in the District. 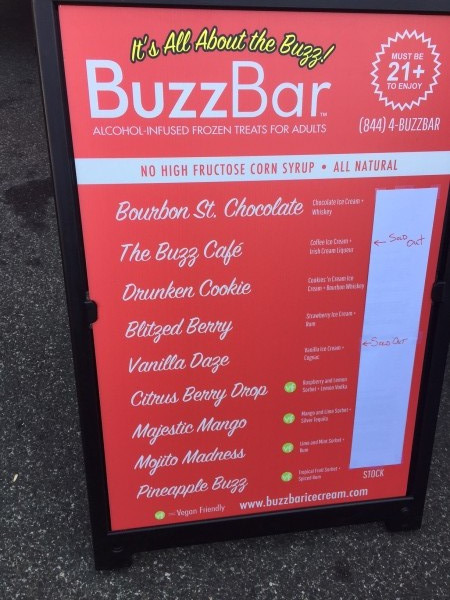 The festival was also the debut of BuzzBar, a boozy ice cream company. The frozen treats were infused with your staple liquors: rum, whiskey, tequila, vodka, and cognac, which made the line insane. I regret not trying one now but the price ($8 a bar) and the wait made me think twice. Hopefully a store will pop up in D.C. soon, as I’m sure we could all appreciate the booze/ice cream mix any time of year. So about this $20 ticket you had to purchase for entry. Were the proceeds going to repaving Pennsylvania Avenue when the festival was done? Did it go to the completion of the Capitol’s renovations? The people want to know. In all seriousness though, the ticket got you a complimentary beverage (if you chose the white wine it was definitely Moscato) and a free rice bowl from ShopHouse Kitchen, the Southeast Asian branch of Chipotle. Go next year if you have a full day to eat and don’t mind spending extra on drink tickets too. I spent 3 hours out there, and you can see the small selection of samples I got through with the help of my sister. If you’re a D.C. foodie this event might not be that impressive to you but it’s still an opportunity to discover something new. For more information on Taste of DC visit TheTasteofDC.org.